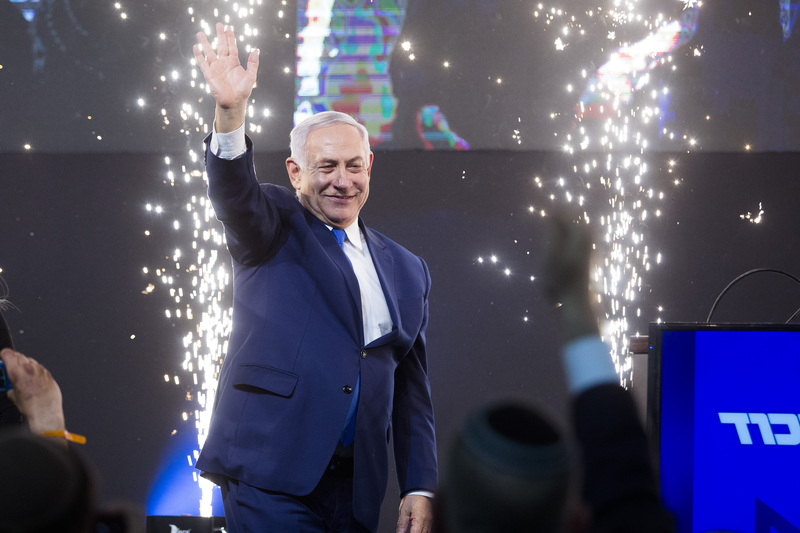 With more than 95 percent of the vote counted, Netanyahu’s Likud party and the opposition Blue and White party are virtually tied, with more than one million votes apiece. According to Israeli news websites, each party is likely to win 35 seats in the 120-seat Knesset, or parliament. But despite the tie, Netanyahu appears to have won the election overall, as his right-wing allies won a solid majority of votes. Israel is governed by coalitions of parties, so the total sizes of the right and left-wing blocs matter more than the size of the biggest party. In total, right-wing parties won 65 seats, while centrist and left-wing parties won a total of 55 seats. That math gives Netanyahu a clear path to forming another governing coalition. A total of 11 parties will likely enter the Knesset. Netanyahu faced a fierce challenge from Blue and White, led by former Israel Defense Forces Chief of Staff Benny Gantz. The prime minister was also hounded by an impending indictment for fraud, bribery and breach of trust. He spent the final days of the race in what pundits called a “gevalt” campaign, warning his voters that unless they turned out, a left-wing government would be established. On Saturday night, he promised to annex West Bank settlements in the coming term, in an effort to shore up his right-wing base. But if the coalition math holds, Netanyahu is poised to become Israel’s longest-serving prime minister. He has held the office for a decade straight, in addition to an initial three-year term in the late 1990s. This election also saw Likud increase its seats in Knesset, from 30 to 35 — the most it’s held since 2005. The 35-seat tie also represents a new high for the opposition. The largest party in the outgoing Knesset, called the Zionist Union, held 24 seats, six fewer than Likud. Alongside Gantz, Blue and White is led by Yair Lapid, a centrist and former news anchor who entered Knesset in 2013. Gantz has yet to concede the race as of early morning Wednesday in Israel. Further down the list, the election came with some surprises. Naftali Bennett and Ayelet Shaked, two prominent stars of the right, may not serve in the next Knesset, as their New Right party has won less than 3.25 percent of the vote — the threshold for entering the Israeli parliament. Likewise, the Zehut party, which combined far-right nationalism with libertarianism — and favored legalizing marijuana — appears likely to fall short of the threshold despite garnering significant press attention during the campaign. The Union of Right-Wing Parties, a slate that includes the extreme-right Jewish Power party, won five seats. So did Israel Beiteinu, the right-wing party led by Avigdor Lieberman, which caters to Russian-speakers. Kulanu, a center-right party focused on economics, won four seats. On the left, the Labor party, which dominated Israeli politics decades ago, won just six seats, an all-time low. Meretz, which is further to the left, won four seats. The Arab-Israeli parties, Hadash-Taal and Raam-Balad, won a total of 10 seats. The numbers may change a bit on Wednesday, as Israeli soldiers’ votes have yet to be counted. Likud won a slim plurality of votes in Jerusalem, Israel’s largest city. Blue and White won more than 45 percent of the vote in Tel Aviv.